Okay, first things first, we ‘fess up: the title of this week’s blog is ripped off a Boomtown Rat’s album. But bear with us, it’s totally relevant; truly. A very long time ago when the Milk Maid was a teenager (the Olden Days, as Farm Girl likes to label this era) she earned her pocket money by babysitting. Generally this was a pretty easy earner: you arrived once the kids were in bed, watched TV, talked to your other babysitting friends on the phone, and just after midnight you were delivered back home by the lesser intoxicated of the parents. Often an evening would pass without you clapping eyes on your charges, save from periodic peeks from the bedroom doorway to assure yourself they were still breathing. This is not about one of those times. This is about the time the parents disappeared without leaving any contact details, the kids were feral, they didn’t have a television, and when said parents had still not reappeared when the clock chimed four, the Milk Maid took a deep breath and phoned Pop. Luckily, during this telephone conversation, someone staggered through the door (a bloke calling himself Uncle Leon) and Pop advised ditching the children to their “uncle’s” tender care, as the Mark IV Zephyr (1970’s family mobile) was at the ready and would be there momentarily, or in ten minutes, whichever came first. NB:Pop would probably remember this incident as the time his daughter stupidly ran sobbing into the night, her history homework clasped to her chest, disregarding all his sage advise to stay put until he turned up. As it happens, the Milk Maid has never disclosed (until now) Uncle Leon’s inability but spirited attempt to sprint with his jeans around his ankles. Anyway, all that aside, although these folk had no television, they did have a rather spectacular stereo system, on the turntable of which was the album this very blog is named for; this night therefore goes down in history as the time the Milk Maid discovered herself a hero in the unremarkable form of Bob Geldof. Sir Bob, as he is now, has had a roller-coaster ride through life. Here at the Homestead we don’t do that whole “he courted the publicity, he’s rich, he deserves all he gets” palaver, believing rather that at base we are all humans, and as one who has just lost his daughter, he is surely hurting big time and our hearts go out to him and his family. He got the “Sir” thing, in part, because when he saw on his TV in 1984 the effect famine was having on the people of Ethiopia and he decided that enough was enough; something had to be done to help those people, and he was going to do it. And he, along with his friend Midge Ure, did. In essence, this scruffy, argumentative, opinionated man said, if you want something changing, do it yourself. Here’s the bit where we show you how relevant our chosen title is to this weeks missive…hopefully. The Homestead, as we have told you countless times before, is situated in the wonderful suburb of New Brighton in the city of Christchurch in the land of Aotearoa/New Zealand. Our suburb is one where people’s differences are generally accepted and often celebrated. It’s a bit ‘alternative’; ‘hippy dippy’; bottom line is it’s a suburb where you can say to your neighbours, “Hey, we’re thinking of taking this whole self sufficiency thing a step further and putting a few of goats in the backyard for milk and cheese and stuff.” and they reply, “Awesome! When and how many?” It’s no secret we love this place we’ve washed up in. It’s also no secret, however, that it’s a place that isn’t exactly seen as an asset by the masses. Run down before the earthquakes, (see Quake Anniversary) it is now pretty sad looking to the outsider, and has been described by more than a few as “an embarrassment”. We Homesteaders have sat through a great many “master plans” devised to restore New Brighton to what it was in it’s hey day and on Wednesday the Goat Herd and Milk Maid trundled along to the New Brighton Club to hear another one. But this one is like no other we’ve been privy to. So, no one else is going to fix our place? Sod it! We’ll do it ourselves! Except they say it in a much more eloquent manner. Meanwhile, back on the Homestead, we’ve spent the week weeding, tidying and closely studying Miss Geraldine. The Raspberry Garden is now looking a little more like it ought with under plantings of lemon balm, thyme and mint, and Miss G is starting to look like a goat expecting a happy event. From her newly adopted goofy, “I love the world” expression, to her pawing at the ground, nest making, and restlessness, SURELY the arrival of the kid/s can’t be too far off?! Actually, we humans are getting a tad nervous. Fingers crossed she’ll handle it all in her usual no-nonsense manner and our input won’t be required but, in the unlikely event that our assistance is needed, we’ve consulted our goatie guru, Fias Co Farm, and assembled our goat birthing kit. Hopefully by next week, we’ll be celebrating the arrival of a/some new Homestead resident/s. And you all? Y’all be subjected to it all, too. Think of it as the goatie version of The Fine Art of Surfacing. 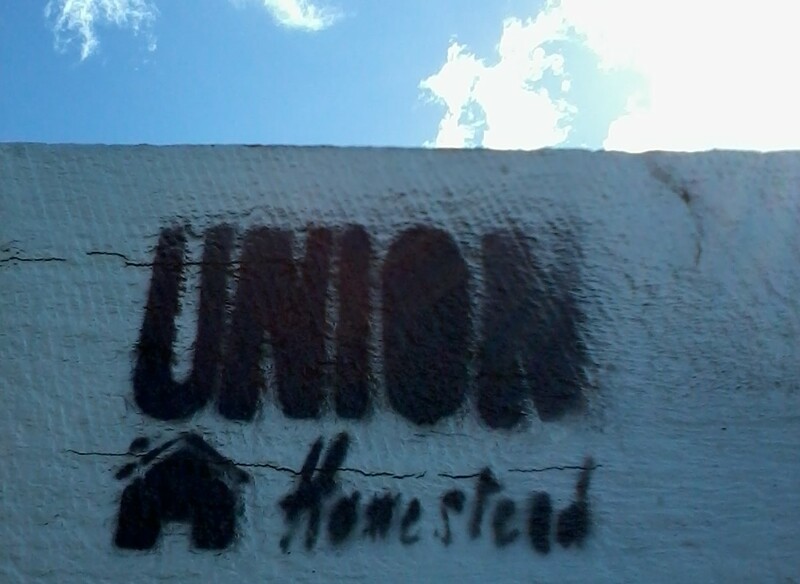 This entry was posted in Union Homestead and tagged 22 February 2011, alternative, Aotearoa, Babysitting. Sir Bob Geldof, birth, bohemian, Boomtown Rats, Change, Change the World in 28 days. Strategic Urban Rejuvenation Force, changing, Christchurch, Christchurch Earthquake, Community, donations, Earthquake, Family, Feed the World, fundraising, Geldof, Goat, goat pregnancy, goats, hippie, homesteading, love, natural disasters, New Brighton, New Zealand, Otautahi, recovery, reflection, rejuvenation, S.U.R.F New Brighton, small holding, SURF, Urban, urban farm, whanau. Bookmark the permalink.